Students will explore the Salem Witch Trials and create a movie trailer summarizing the events. Students will be able to analyze a historical image and make inferences. Students will be able to identify the key people involved in the Salem Witch Trials. Students will be able to explain what caused the Salem Witch Trials. Students will be able to develop their own theories on why the Witch Trials occurred. Students will be able to create their own movie trailer summarizing events in a logical and appealing manner. Create a document (word, pages, etc.) 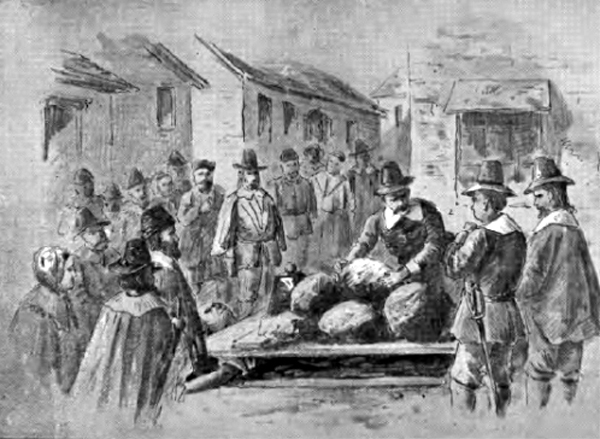 with an image depicting the Salem Witch Trials (http://www.legendsofamerica.com/photos-massachusetts/gilesCoreyPressed.jpg) accompanied by the NARA photograph analysis worksheet (http://www.archives.gov/education/lessons/worksheets/photo.html). Instruct students to log onto Edmodo to view their next assignment. Instruct students to download and send the document to whichever app you use to annotate (personal.crocodoc, Drive, notablePDF, Notability, etc.). Have students individually (or as members of a team) analyze the image and fill out the worksheet. Share responses and answer questions as a class. Have students turn in the assignment using Edmodo. Create guided viewing questions to accompany the Salem Witch Trial documentary (https://www.youtube.com/watch?v=wDdtOwYi8vY). Be sure to create questions that reach the highest levels as possible. Provide either a paper copy of the video questions or a digital copy to be completed in Google Drive or annotating app of your choice. Have students complete the video questions, pausing for additional explanations and discussion being sure to emphasize the most important points. Show an example of any well known, eye-catching movie trailer that is appropriate for your grade level. Tell students that they will be creating a trailer for a new movie about the Salem Witch Trials. Using the "Trailer" option in the iMovie app, students will input the appropriate text, images and video to create a two minute trailer displaying their understanding of the events. If you have not used this feature in iMovie it is extremely easy and uses production templates to create high quality projects. When the students are done with their projects you can have a showcase of all the trailers. Create a quiz using Kahoot.it to asses student understanding of the Salem Witch Trials. Students will compete against each other to see who can get the highest scores. The website provides instantaneous feedback for both the student and the teacher. The results can also be downloaded for further analysis. Use the results to determine if any remediation is needed.